It was 4 p.m. when I got a call from Kuya Dennis of the Philippine Daily Inquirer. the scheduled meet and interview was a go. it was a hush-hush affair, only the two of us were allowed to go up in the mountains of Diwalwal for the interview. I just learned ate Edith of Philippine Star was already in the area, she was one of very few persons granted permission. 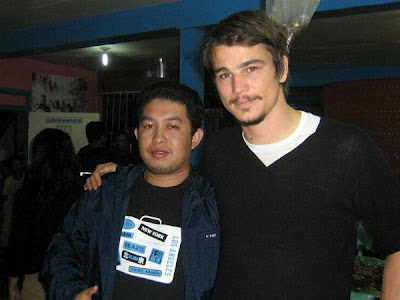 Mr. Josh Hartnett, star of hollywood blockbusters like blackhawk down, Pearl Harbor and 40 days and 40 days along with many films was filming in the gold mining area of Diwalwal. the movie entitled "I come with the rain" was directed by acclaimed Vietnamese film director Tran Anh Hung who is renowned for his film "The Scent of Green Papayas." we reached Monkayo (the nearest town center to Diwalwal) by 9 p.m. and managed to get habal-habal (motorbike transport) to go up for an hour drive. it was in the middle of the night. I was apprehensive of the trip up, since the area is an active New People's Army stronghold and bandits and robbers may be prowling the road. plus the road at some stretches was terrible, felt like I was riding a motocross rally. but fortunately the night was peaceful and trip was safe. 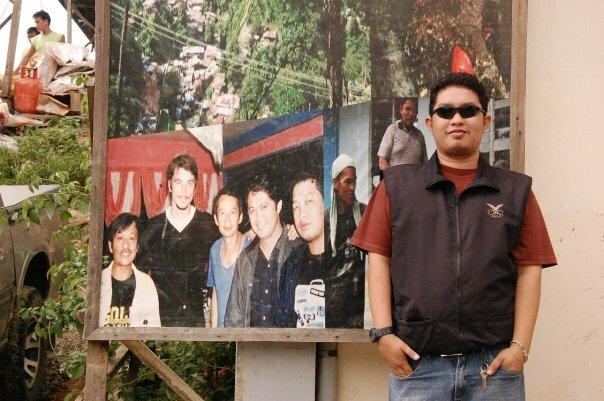 We reached Pink House Lodging House, a spartan lodging establishment which was home to the crew and staff of the film including Mr. Hartnett and director Hung. The lodging house was filled with people comprised of the community, the crew and the military personnel. it was some sort of a celebration as the film had wrap up its shooting in Diwalwal. 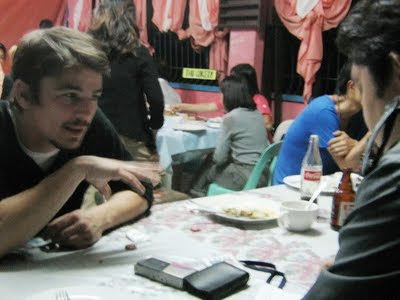 we later found out that Mr. Hartnett had chunked in about $300 from his own money to buy beer and lechon for the party. We got to interview Mr. Hartnett, face-to-face with a hollywood star. but the actor was down-to-earth and kind. no pretentious moviestar air. he reminded me of talking to my American Rotex classmates. a few sips of beer and the interview rolled. he said that he the shoot in Diwalwal was great. the crew was fantastic and the people of the community were terrific, although he was uncomfortable by the army security. He said he liked diwalwal, describing it as a "gorgeous part of the world." he told us of a waterfalls where they shot near the mines and promise to return there if ever he has the time. He praised Direk Tranh Anh Hung, describing him as very meticulous. He said the film is very different and his character as unique. He said his film is a unique experience and his weeklong visit to diwalwal was more than an ordinary weeklong experience for him. 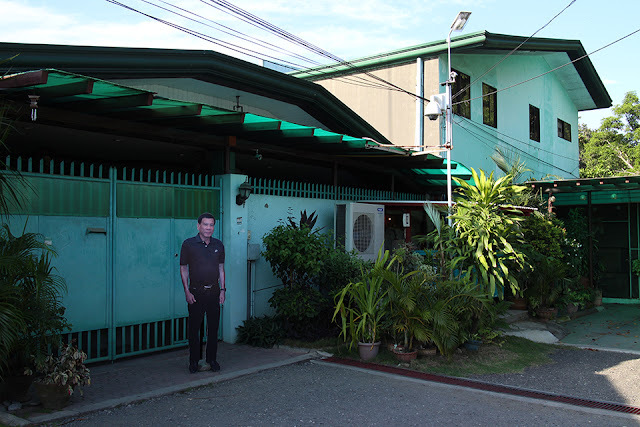 Mr. Hartnett was a former Vegan, fell in love with our lechon and the san miguel beer. he said he likes senorita bananas and craves for mangosteen. he also said he tried and liked durian although it has not the best of scent. I told him of the story of Claire Danes, and how when she shot Brokedown Palace in Manila (along with Kate Beckinsale and Bill Pullman) she dissed the city during one of her interviews. Mr. Hartnett told me that if he ever would be interviewed he could only describe Diwalwal since the only places he visited aside from Diwalwal was the NAIA and the Davao Airport. 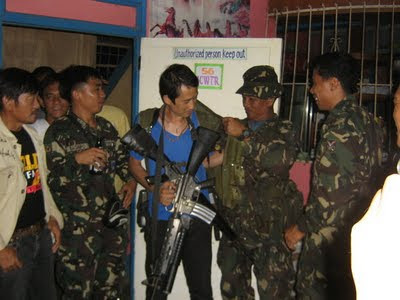 During the interview, we cant help but notice some people from the local community, the soldiers approaching him asking for pictures or autographs he would exchange chitchat with them. He was one down-to-earth fellow. it was said that during breaks he would roam around the community and greet the local people. he said his treat was a way of thanking people for the very warm hospitality to him and to his crew. As for his work, Mr. Hartnett says that his role in "I come with the rain" is different just like his role in "The Black Dahlia" and says that he makes it a point to tackle different kinds of roles in his movies. never wanting to be box in one character. he says that some of his movies coming out will have him tackle different roles like a sportswriter in Resurrecting the Champ (with Samuel L. Jackson) and a sheriff battling vampires in 30 days of night. He says that to be a good actor you must experience life like experiencing love and heartbreaks. all these experiences makes you more textured and more matured he says. After the talk he excused himself to get to entertain the community in the party. we got to talk to director Hung, it was a great experience in talking with a renowned filmmaker. His films were a must of every film student's library. He recounted that 15 years ago, in France he saw a documentary about Diwalwal and promised to film in that place. when the I come with the rain project came, Direk Hung wasted no time in coming to Diwalwal ans scouting the location. despite a letter from the hollywood union discouraging the filming in the region. Direk Hung persisted. he said he was offered different locales around the country but he said that he cannot picture any location other than diwalwal. Direk Hung said the film is heavily grounded on spirituality. He says that the film is set to debut on Cannes this May next year. I also got the opportunity to invite the director to grace our Mindanao Film Festival this December. direk Hung, was elated that there is a filmmaking community in Davao. he encouraged the filmmakers to make films about our own unique culture, people and locality. he said he wants to come to December but was not sure if he could since he would be busy for "I come with the rain." but he promised that he could do it next year. and he Direk Hung gave me his email address just so that we could keep track with him. Mr. Hartnett returned, we chatted briefly about Minnesota, which he hails and where most of my US-based relatives reside. then I asked him to sign a dedication for my sister, since she was badgering me to have him sign a dedication. 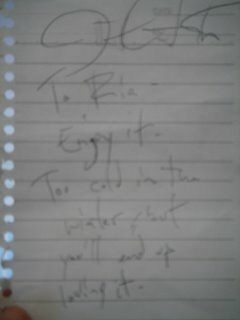 Mr. Hartnett obliged and asked things about my sister then wrote a specially written dedication. I could have asked him about my crush Scarlett Johansson who was his ex. but earlier he asked that we refrain from talking about his personal life. but I read in one of his interviews that he was crushed with his break-up with Scarlett. but still, the fact of talking to Mr. Hartnett has bridge the very distant gap between me and Scarlett into a one-degree of Separation. Afterwards Mr. Hartnett returned to Monkayo as he would going to Hongkong the day after. we stayed in the party for a little while then proceeded to barangay hall in which our ever-gracious host Barangay kapitan Franco Tito offered as a place for us to stay for the night. the rest of the night Brgy. Capt. Tito, while us with his stories about Diwalwal. Direk Tran Anh Hung is outfitted with real military gear by his Army escorts. Direk Tran's latest film is a film adaptation of Haruki Murakami's Norwegian Wood. Wow Josh Harnett! You're very lucky! galing! I'll look for that movie nga.. haha you gave me an idea what to do this weekend..
Wow! You got very lucky. John Hartnett is a heartthrob. Woottt.. ang gwapo!!!! You were at the right place, at the right time. Not a lot of people will get the same chance and experience. ang swerte!!! panalo.. buti di ka na nosebleed joke! We seldom got rare opportunities such as interviewing a huge star as him and I just don't know if everybody just can handle that. Obviously, you did. You must be somebody bro! Astig! Pare pwede mong ibenta sa eBay ang perma n'ya in the future. Worth of fortunes yan. You're very lucky to have an oppurtunity to interview him. Happy weekend! 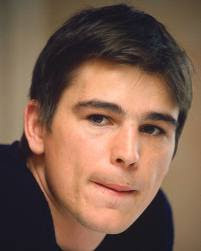 Awwww Josh Hartnett.. you're one lucky guy. We can only dream about getting close to him. ang swerte mo naman... bibihira lang ang pagkkataon na yan huh.